Since Halloween is almost upon us, I thought I’d branch off to something a little different and post a bit of the Introduction to my upcoming book The Gothic Wanderer, which will be a study of nineteenth century British Gothic horror fiction, and should be published sometime in 2012. But in keeping with my autobiographical postings here, this passage talks about my fascination with scary stuff from an early age before I go into the details of Gothic literature. I’m sure many of you, especially those around my age, have similar stories. Happy Halloween, everyone! I love the Gothic. Most of us do, even if we don’t know exactly what the term “Gothic” means. It may mean different things to all of us, yet those things are closely related. Some of us might think of the Goth look where teenagers wear all black. Others might think of Gothic cathedrals. And a smaller percentage of us might think about classic Gothic literature—the great eighteenth and nineteenth century novels of Mrs. Radcliffe, Mary Shelley, Bram Stoker, and several others. Many of us have a fascination with being scared. I love to be scared—I don’t go for the gory horror films of today, but I love suspense and the greatest Gothic literature builds up such suspense. But more importantly, Gothic literature reveals much about who we are, what we fear, and to what we aspire. I was fascinated with the Gothic—commonly called horror, or simply, when I was growing up in the 1970s and 1980s, what was “scary.” I didn’t know the term Gothic and wouldn’t know it until well into high school, but I knew the Munsters, the Addams Family, Casper the Friendly Ghost, Broom-Hilda the Witch, and countless other characters in popular culture from that time who were often watered down children’s versions of the Gothic. I remember the “Creature Feature” film being shown Saturday afternoons on TV50 from Detroit, and I loved Love at First Bite (1979) starring George Harrison as Dracula—when it was broadcast on TV for the first time, my brother and I had a big fight over the TV (we only had one in the house in those days) because it shown opposite Yogi’s First Christmas. 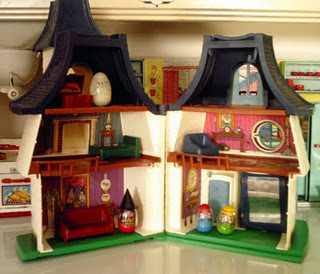 The Weebles Haunted House - unfortunately, I got rid of mine so I had to resort to an image I found online - I wish I still had it - Hours of Scary Fun! I was the proud owner of the Weebles Haunted House complete with weebles that “wobble but they don’t fall down”—including the witch with a removable pointy hat, a glow-in-the dark ghost, two weeble children to be scared, secret panels, trapped doors, and a treasure chest with bats inside. All of it scary but wonderful! In fourth grade, I was Dracula for Halloween—I remember still the thrill of running so my cape would flap in the wind, and I can still taste the plastic vampire teeth. Nor did I ever miss going through a Haunted House at the fair, and my friends and I commonly played haunted house, turning our bedrooms or the family room into a mansion of monsters and ghosts. Again, I was always Dracula. And perhaps best of all, I owned the wonderfully dramatic record The Story of Dracula, the Wolfman and Frankenstein from Power Records. This fabulous 33 1/3 record came with a read along book in graphic novel form (we called them comic books back then) and it combined into one dramatic tale the stories of its title characters. I played this record over and over again and still have my copy today. I constantly quoted it to others, including the pivotal scene when the werewolf (oddly not the Wolfman but Vincent von Frankenstein’s girlfriend Erika—Wolfwoman, I guess) attacks the count, causing him to become enraged and reveal himself by declaring, “You dare!! You dare lay your paws on me! On me?! Low beast, you’ll die for this, die at the hands of the Prince of Darkness…FOR I AM DRACULA!” Recently, when I was working on this introduction, I dug out the record to engage in nostalgia and left I on my coffee table. My brother came over to visit and saw the record there and rolled his eyes. When I asked whether he wanted to listen to it, he said, “No, I never want to have to listen to that record again.” Apparently, I played it one—or maybe fifty—too many times. But all these details could be dismissed as children’s games and just good fun (despite the fanatics who would ban The Wizard of Oz, or more recently, the Harry Potter books and films because they contain depictions of witchcraft). Only, I think on some innocent level I could not have articulated when I was ten years old, I was even then searching for meaning—to understand the mystery of life, even if it were only the simplified notion of good and evil. I was a very religious child who had read the entire Bible by fifth grade, loved to play at being various characters from the Bible—mostly Moses or Jacob—and wanted to grow up to be a priest. So if I were such a “religious nut”—as one friend called me—how am I to explain my fascination with horror and the supernatural? And how explain my curiosity over an activity that countless children have attempted over the years? Yes, I am one of those many children who locked himself in the bathroom in the dark, stared into the bathroom mirror, and then tried to find out whether it was true that if I could say, “Bloody Murder!” one hundred times without blinking, the devil would appear in the mirror. But I was never able not to blink before I could say it one hundred times, or I would inevitably lose count. Still, the quest for forbidden knowledge was strong in me at an early age. The fascination with Good and Evil thrilled me like it does many children, but I wanted proof that the supernatural forces of Good and Evil truly existed. Years later, when I discovered Percy Shelley’s lines quoted above, I was stunned by how perfectly he captured what I felt, his experiences matching mine of nearly two centuries later. And like Shelley, I eventually grew to love Intellectual Beauty….